The Museum, founded by Roger Freeman, is open today in temporary housing at Old Kingsbury Aerodrome. Although we're working on getting our permanent museum building up, we are open! Please donate to help us build our museum! Our normal open hours are from 9:00 AM to 2:00 PM Monday through Saturday. We are also open on volunteer workdays from 9:00 AM to 5:00 PM, please see our EVENTS CALENDAR for current work day dates. For other times, please call 830-639-4162 for appointments. Please note that calling in advance for more information and/or tour arrangements is always a good idea, to ensure that somebody can be available to answer questions! But again, be sure to give us a call since we are often here on these days, and happy to show folks around whenever we can. We can be contacted by phone at 830-639-4162, or by email at info@pioneerflightmuseum.org. Our dedicated staff is happy to help! 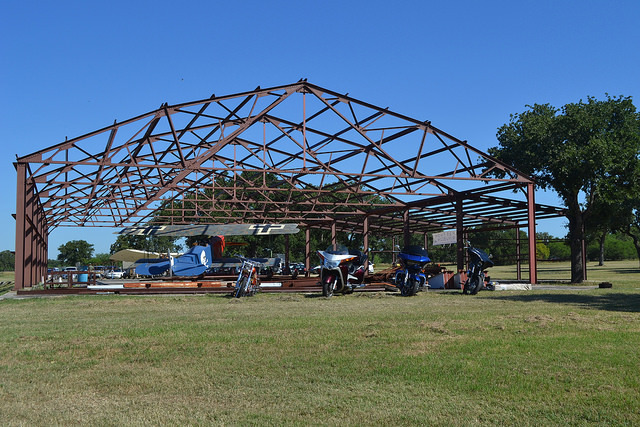 The Pioneer Flight Museum has acquired an original World War I hangar to serve as the museum building. The structure has been moved to the museum grounds, and will be re-built and restored. A concrete slab has been poured to serve as the museum foundation, and the structure has been erected. PFM is seeking donations to help cover the cost of finishing the building. This picture shows an aerial view of Dodd Field taken in the early 20th century. The black building at the north end of the field is the hangar that we have acquired. 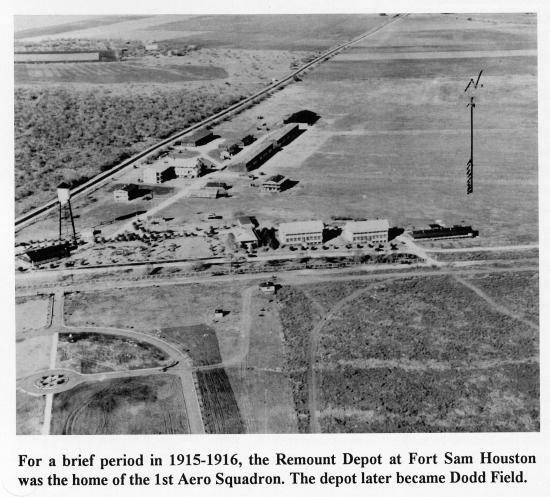 After Dodd Field was closed, this building was dismantled and moved to Fort Sam Houston. Over the years, it was moved several times, and served a variety of purposes for the Army. PFM will use the hangar as its primary exhibit building, housing the non-flying and historical artifacts owned by the foundation.